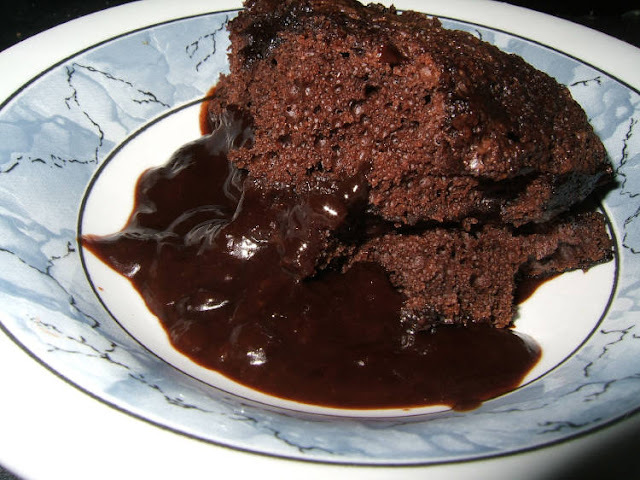 As it cooks, it separates out into a sponge topping with a lovely crunchy crust, and a rich chocolate sauce underneath. Yum! Grease a 1 1/4 pint pie dish. Sift together the flour, salt, sugar, baking powder and 2 tbsp cocoa powder. Combine the milk, butter and egg in a separate bowl then mix into the dry ingredients. Pour into the pie dish, cover and refrigerate for at least 1 hour (overnight is fine if you want to make it in advance). Sift the other 2 tbsp cocoa powder and mix with the demerara sugar and sprinkle over the top of the pudding. Pour over the boiling water then bake for 45 minutes, until puffy and firm. Keep an eye on it - I usually find it only needs about 30 minutes at 180oC in a fan oven.